Most functions that make use of the stack in 64-bit versions of Windows must support exception handling even if they make no internal use of such facilities. This is because these operating systems locate exception handlers by using a process called “stack unwinding” that depends on functions providing data that describes how they use the stack. When an exception occurs the stack is “unwound” by working backwards through the chain of function calls prior to the exception event to determine whether functions have appropriate exception handlers or whether they have saved non-volatile registers whose value needs to be restored in order to reconstruct the execution context of the next higher function in the chain. This process depends on compilers and assemblers providing “unwind data” for functions. The following sections give details of the mechanisms that are available in Yasm to meet these needs and thereby allow functions written in assembler to comply with the coding conventions used in 64-bit versions of Windows. These Yasm facilities follow those provided in MASM. Figure 16.1 shows how the stack is typically used in function calls. When a function is called, an 8 byte return address is automatically pushed onto the stack and the function then saves any non-volatile registers that it will use. Additional space can also be allocated for local variables and a frame pointer register can be assigned if needed. The first four integer function parameters are passed (in left to right order) in the registers RCX, RDX, R8 and R9. Further integer parameters are passed on the stack by pushing them in right to left order (parameters to the left at lower addresses). Stack space is allocated for the four register parameters (“shadow space”) but their values are not stored by the calling function so the called function must do this if necessary. The called function effectively owns this space and can use it for any purpose, so the calling function cannot rely on its contents on return. Register parameters occupy the least significant ends of registers and shadow space must be allocated for four register parameters even if the called function doesn’t have this many parameters. The first four floating point parameters are passed in XMM0 to XMM3. When integer and floating point parameters are mixed, the correspondence between parameters and registers is not changed. Hence an integer parameter after two floating point ones will be in R8 with RCX and RDX unused. When they are passed by value, structures and unions whose sizes are 8, 16, 32 or 64 bits are passed as if they are integers of the same size. Arrays and larger structures and unions are passed as pointers to memory allocated and assigned by the calling function. The registers RAX, RCX, RDX, R8, R9, R10, R11 are volatile and can be freely used by a called function without preserving their values (note, however, that some may be used to pass parameters). In consequence functions cannot expect these registers to be preserved across calls to other functions. The registers RBX, RBP, RSI, RDI, R12, R13, R14, R15, and XMM6 to XMM15 are non-volatile and must be saved and restored by functions that use them. Except for floating point values, which are returned in XMM0, function return values that fit in 64 bits are returned in RAX. Some 128-bit values are also passed in XMM0 but larger values are returned in memory assigned by the calling program and pointed to by an additional “hidden” function parameter that becomes the first parameter and pushes other parameters to the right. This pointer value must also be passed back to the calling program in RAX when the called program returns. Functions that allocate stack space, call other functions, save non-volatile registers or use exception handling are called “frame functions”; other functions are called “leaf functions”. Frame functions use an area on the stack called a “stack frame” and have a defined prologue in which this is set up. Typically they save register parameters in their shadow locations (if needed), save any non-volatile registers that they use, allocate stack space for local variables, and establish a register as a stack frame pointer. They must also have one or more defined epilogues that free any allocated stack space and restore non-volatile registers before returning to the calling function. 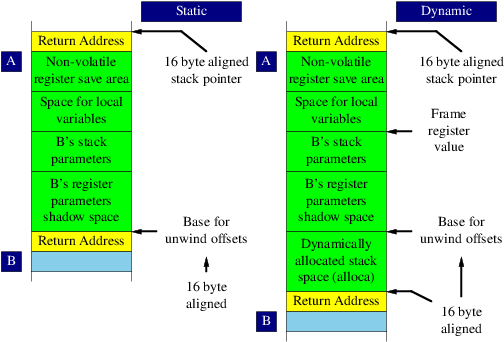 Unless stack space is allocated dynamically, a frame function must maintain the 16 byte alignment of the stack pointer whilst outside its prologue and epilogue code (except during calls to other functions). A frame function that dynamically allocates stack space must first allocate any fixed stack space that it needs and then allocate and set up a register for indexed access to this area. The lower base address of this area must be 16 byte aligned and the register must be provided irrespective of whether the function itself makes explicit use of it. The function is then free to leave the stack unaligned during execution although it must re-establish the 16 byte alignment if or when it calls other functions. Leaf functions do not require defined prologues or epilogues but they must not call other functions; nor can they change any non-volatile register or the stack pointer (which means that they do not maintain 16 byte stack alignment during execution). They can, however, exit with a jump to the entry point of another frame or leaf function provided that the respective stacked parameters are compatible. These rules are summarized in Table 16.1 (function code that is not part of a prologue or an epilogue are referred to in the table as the function’s body). [a] but 16 byte stack alignment must be re-established when any functions are called. [b] but the function parameters in registers and on the stack must be compatible. As already indicated, frame functions must have a well defined structure including a prologue and one or more epilogues, each of a specific form. The code in a function that is not part of its prologue or its one or more epilogues will be referred to here as the function’s body. When a frame pointer is needed the programmer can choose which register is used (“bias” will be explained later). Although it does not have to be used for access to the allocated space, it must be assigned in the prologue and remain unchanged during the execution of the body of the function. If a large amount of stack space is used it is also necessary to call __chkstk with size in RAX prior to allocating this stack space in order to add memory pages to the stack if needed (see the Microsoft Visual Studio 2005 documentation for further details). These are the only two forms of epilogue allowed. It must start either with an add rsp,const instruction or with lea rsp,[const+fp_register]; the first form can be used either with or without a frame pointer register but the second form requires one. These instructions are then followed by zero or more 8 byte register pops and a return instruction (which can be replaced with a limited set of jump instructions as described in Microsoft documentation). Epilogue forms are highly restricted because this allows the exception dispatch code to locate them without the need for unwind data in addition to that provided for the prologue. The data on the location and length of each function prologue, on any fixed stack allocation and on any saved non-volatile registers is recorded in special sections in the object code. Yasm provides macros to create this data that will now be described (with examples of the way they are used). There are two types of stack frame that need to be considered in creating unwind data. 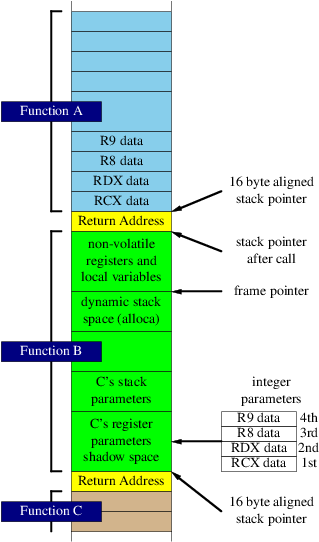 The first, shown at left in Figure 16.2, involves only a fixed allocation of space on the stack and results in a stack pointer that remains fixed in value within the function’s body except during calls to other functions. In this type of stack frame the stack pointer value at the end of the prologue is used as the base for the offsets in the unwind primitives and macros described later. It must be 16 byte aligned at this point. In the second type of frame, shown in Figure 16.2, stack space is dynamically allocated with the result that the stack pointer value is statically unpredictable and cannot be used as a base for unwind offsets. In this situation a frame pointer register must be used to provide this base address. Here the base for unwind offsets is the lower end of the fixed allocation area on the stack, which is typically the value of the stack pointer when the frame register is assigned. It must be 16 byte aligned and must be assigned before any unwind macros with offsets are used. In order to allow the maximum amount of data to be accessed with single byte offsets (-128 to \+127) from the frame pointer register, it is normal to offset its value towards the centre of the allocated area (the “bias” introduced earlier). The identity of the frame pointer register and this offset, which must be a multiple of 16 bytes, is recorded in the unwind data to allow the stack frame base address to be calculated from the value in the frame register. Here are the low level facilities Yasm provides to create unwind data. Generates a function table entry in .pdata and unwind information in .xdata for a function’s structured exception handling data. Generates unwind data for the specified non-volatile register. Use only for non-volatile integer registers; for volatile registers use an [allocstack 8] instead. Generates unwind data for a frame register and its stack offset. The offset must be a multiple of 16 and be less than or equal to 240. Generates unwind data for stack space. The size must be a multiple of 8. Generates unwind data for the specified register and offset; the offset must be positive multiple of 8 relative to the base of the procedure’s frame. Generates unwind data for the specified XMM register and offset; the offset must be positive multiple of 16 relative to the base of the procedure’s frame. Generates unwind data for a 40 or 48 byte (with an optional error code) frame used to store the result of a hardware exception or interrupt. Signals the end of the prologue; must be in the first 255 bytes of the function. Used at the end of functions started with proc_frame. Example 16.1 shows how these primitives are used (this is based on an example provided in Microsoft Visual Studio 2005 documentation). ; have a frame pointer. If we didn't have one this would be illegal. ; A frame pointer is needed because of this stack pointer modification. From the descriptions of the YASM primitives given earlier it can be seen that there is a close relationship between each normal stack operation and the related primitive needed to generate its unwind data. In consequence it is sensible to provide a set of macros that perform both operations in a single macro call. Yasm provides the following macros that combine the two operations. Generates a function table entry in .pdata and unwind information in .xdata. Allocates a stack area of n bytes. Saves a non-volatile register reg at offset loc on the stack. Pushes a non-volatile register reg on the stack. Pushes a non-volatile register reg on the stack using a 2 byte push instruction. Saves a non-volatile XMM register reg at offset loc on the stack. Sets the frame register reg to offset loc on the stack. Pushes the eflags register using a 2 byte push instruction (allows hot patching). Pushes a 40 byte frame and an optional 8 byte error code onto the stack. Ends the function prologue (this is an alternative to [endprolog]). Used at the end of funtions started with proc_frame. Example 16.2 is Example 16.1 using these higher level macros.